Learn how easy it is for Attendees to join and view webinar events. 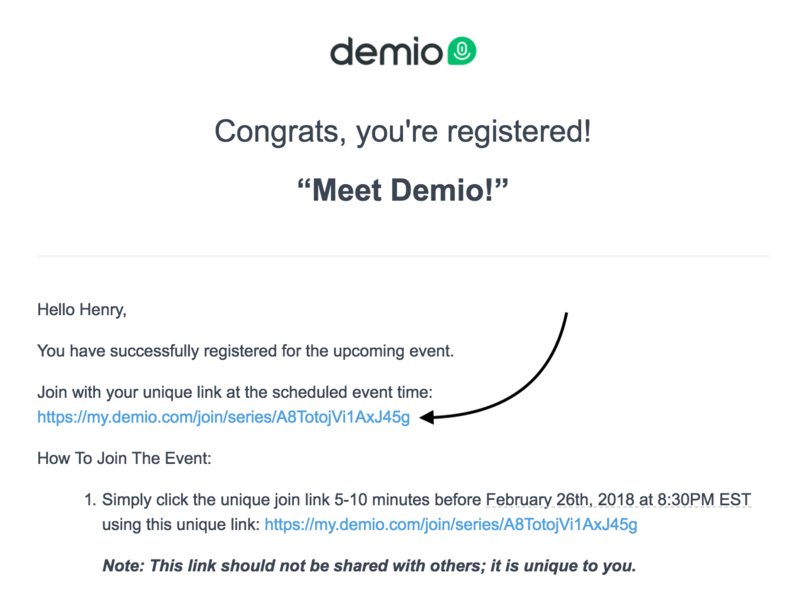 Joining an webinar on Demio as an Attendee is super simple! 1. First, you'll want to make sure you've successfully registered for an event. Once you've done so, you should be sent an email* with a Unique Join Link! * Sometimes Hosts can disable the Confirmation/Reminder emails, in which case, they'll usually send you the Unique Join Link directly. If they don't, you can contact them directly to get access to the link. 2. Once you have the link, you'll be able to use the link directly in one of our supported browsers. If your default browser is set to one of the browsers from above, you'll be able to simply click your Unique Join Link*! You can check and set your default browser on Mac and Windows. You can also launch the browser application directly and simply copy-paste the link. * Be sure not to share your Unique Join Link with anyone else. 3. Voila! You will now be brought to the Webinar Room and Demio will automatically log you in! If the webinar hasn't started yet, you'll be brought to a Waiting Room instead. Once the webinar starts, you'll automatically be redirected to the Webinar Room.